This exhibition offers a look at a largely unexamined aspect of the career of one of the most highly influential thinkers and artists of the 20th century. This exhibition features Adolph Gottlieb’s little-known monotypes that he worked on between the summer of 1973 and February 1974. An intimate suite of works created within the last 9 months of the artist’s life, these monotypes are a summation of Gottlieb’s 50-year career as a painter. Regarded as one of the founding members of Abstract Expressionism in the United States, Gottlieb was one of the leading artists of his generation responsible for forging a new identity for American art following World War II. Unlike most of his colleagues who concentrated their efforts on painting, Gottlieb completed major projects in various media including sculpture, tapestries, stained glass—and prints. The overall impact of the series of monotypes is profound. They are the personal notes of an artist of long experience who was aware he was nearing the end of his life. He explored virtually every pictorial idea of his long career and reached for new expressions with as much energy as he possessed. His manipulations of paint, inks, image, and surface were as subtle and powerful as anything in his career. 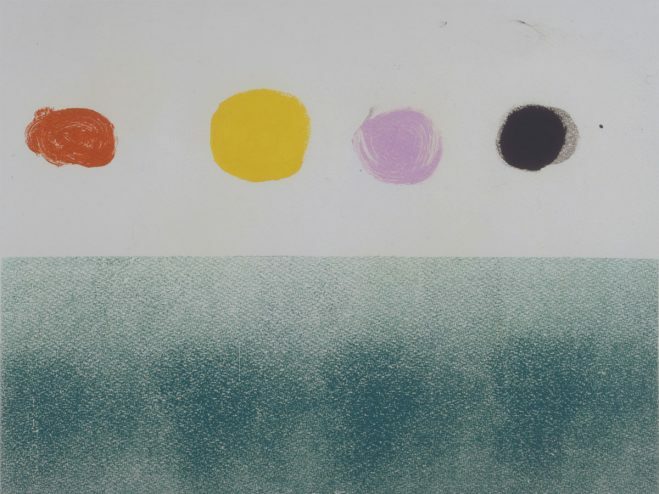 Gottlieb’s final monotype was made the last week of February 1974. That same week he entered the hospital for treatment of emphysema. He died on March 4. The monotypes he made between the summer of 1973 and February of 1974 are a summary of a rich career and a testament to the creativity that propelled this artist throughout his life. This exhibition includes 40 of the 54 monotypes Gottlieb created. A Painter’s Hand: The Monotypes of Adolph Gottlieb is organized by the Adolph and Esther Gottlieb Foundation, Inc.